THE WOODLANDS, Texas — Angry space scientists have launched a call to action to restore NASA's planetary science budget — a rallying cry to push back on President Obama's proposed fiscal year 2013 budget for NASA. That budget calls for deep cuts to the nation’s planetary science program, a drop of more than 20 percent. 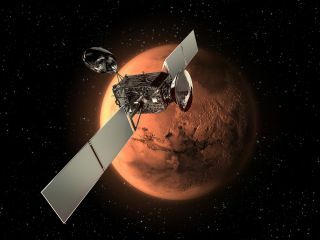 The reduction in NASA's planetary budget by $309 million includes cutting the Mars exploration program by $130 million. Some 2,000 space researchers and luminaries are attending the 43rd Lunar and Planetary Science Conference here, and they are not happy. Some 2,000 space scientists are attending this year's Lunar and Planetary Science Conference. "Part of the reason that planetary [science] got 'whacked' … is because the planetary community is perceived in certain powerful circles as being weak," said Andrew Chaikin, a veteran science journalist, space historian and author. "We have to come together and show them you're not weak," he said before a town hall gathering of disgruntled space scientists. "We have to come together and respond in a sustained way to chart our own course," Chaikin said. Backing that view is noted Mars scientist Steven Squyres, the Goldwin Smith Professor of Astronomy at Cornell University in Ithaca, N.Y. Squyres is Cornell's principal investigator for NASA's Opportunity rover currently exploring Mars. Last year, he chaired a major space science review — the Planetary Science Decadal Survey: Vision and Voyages for Planetary Science in the Decade 2013-2022. A year later, the findings of that detailed space exploration blueprint have fallen victim to budget cuts. "There's need to respond as a united community … that cannot be stressed too much," Squyres said. He urged the gathering to not react as a community of Mars fans, or Europa fans, not even respond as a community of planetary scientists. "Respond as a community of space scientists." Squyres said he has spent a lot of time since the proposed NASA budget came out talking to various decision makers in Washington, D.C., on Capitol Hill and elsewhere. "I will tell you that as bad as this looks … [there are those] looking for ways to cut even further," Squyres said. "What we must not do is to give anybody a reason for cutting planetary further … there's going to be pressure to do that." Squyres added: "There's no surer way to give budget cutters, and there are a lot of them out there, a reason to go after the planetary program than to project appearance of disunity, disarray, disagreement, as to what we should be doing. We must speak as one voice." Joining in on the call to action is scientist Laurie Leshin, dean of the school of science at Rensselaer Polytechnic Institute and president of the American Geophysical Union’s Planetary Sciences Section. Leshin is a former deputy associate administrator of exploration systems for NASA. "This is an egregious cut," Leshin said. "NASA can't fight this fight for us. We have to take it to the Hill." Key decisions are being made that will shape NASA's space science program. Photo captures a Planetary Science Decadal Steering Committee meeting at the National Academies' Beckman Center in Irvine, Calif. That report, issued last year, has been derailed by proposed NASA budget cuts. Among impacts from the proposed budget is cancellation of two ambitious Mars missions with the European Space Agency, an act that may not be recoverable at this point, scientists contend. The impact of budget cuts also means that no new flagship-class missions — no more Voyager, Galileo or Cassini-like spacecraft exploration, with the now en-route Mars Science Laboratory as the last of that category. Furthermore, space scientists point out that the budget ax degrades the workhorse NASA Discovery program from an early cadence of 24 months to 56 months, and degrades the New Frontiers program from a planned cadence of two per decade to one per decade. Leshin urged space scientists to get engaged for the fight. She suggested that a weak planetary science program is going to result in a weak NASA, at a time when the space agency is attempting to scope out human space travel beyond low-Earth orbit. "We need to get this reversed. If this cut stands this year, restoration in future budgets will be much more difficult. Our time is now, these next few months," Leshin said. In summing up the situation, Squyres said: "We all must hang together or we will hang separately."